Every year, WB Surf Camp has the special pleasure (read honor) of taking a very special group of young adults to paradise. Paradise in this case being the beautiful country of Costa Rica. At the beginning of January, we embarked on an awesome journey. 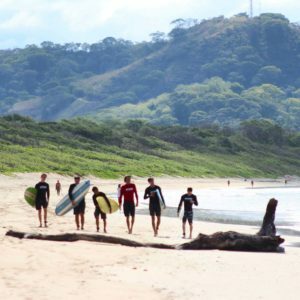 for a week of surfing, marine science education, and service to the local community! It was, by far, one of the best trips we’ve taken to date. The group of young 15 men who made the trek, attend Wheaton Academy in Chicago, an elite school that produces some of the country’s best young minds. Their intelligence, eagerness and overall zest for adventure didn’t disappoint and was the heart of the program. 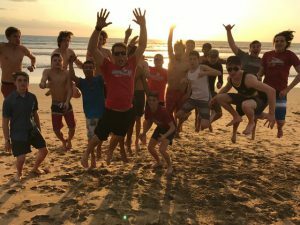 The trip was a wonderful opportunity for the students to learn about the region’s ecosystem, marine life, local customs and, as well, serve the Costa Rican community by performing an awesome service project. This year, the team poured the concrete floor of “Iglesia Casa Vida,” a church founded by a group from the Christian Surfers organization. The experience was also filled with fun activities like jungle zip-lining, snorkeling, beach clean-ups and relaxing yoga. We started the adventure with three days of classroom science at Wheaton Academy. These lessons were topped off with the team getting to participate in a hands-on shark dissection. What a spectacular way for the students to learn about the wonders of the ocean and learn respect for these crucial animals! After leaving the cold weather of Chicago, we headed for the beautiful, warm beach town of Playa Grande, Costa Rica. The week only got better as the crew set out on daily surf adventures! The level of surfing progression from the beginning of the week to when it ended was amazing. The guys went from beginners to full-on surfers in no time! 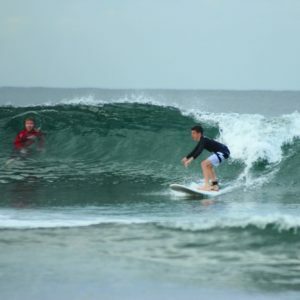 Surf sessions in perfect, warm water waves are everyone’s favorite part of days spent in this tropical paradise! These “board meetings” helped the team build confidence, determination and ocean safety. It is during this time that we learned the true nature of PURA VIDA or the pure life!!!! Locals and visitors alike all share this good-natured idea and it truly is a great way to experience a different culture. Anyone who has ever traveled to Costa Rica knows exactly what kind of a special place it is. Our company is beyond stoked and incredibly grateful to have had the opportunity to share this magical place with such an inspiring group of young men. It was a week of good friends, good waves, good vibes and community service in a GREAT country… truly a time for bonding and forming lifelong friendships!